Diagnostic Features - Monomorphic or polymorphic. Antennae 10-segmented with a 2-segmented club. Mandibles with three or four teeth. Maxillary palp geniculate. Clypeus strongly longitudinally bicarinate, the median area sharply elevated and deeply inserted between the frontal carinae. Promesonotal suture absent; metanotal groove impressed; propodeum unarmed. 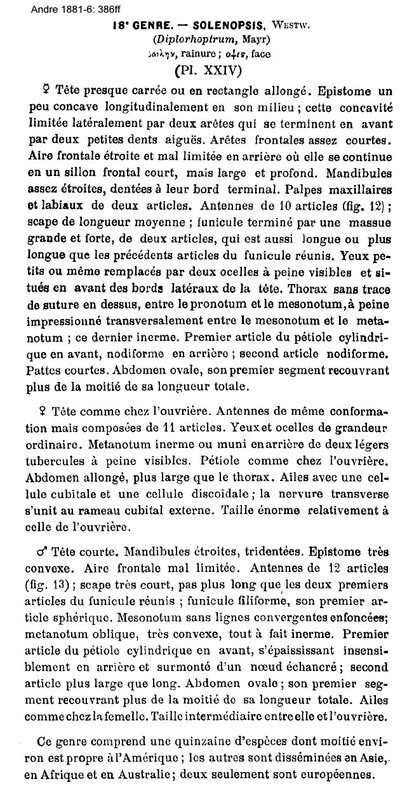 Westwood's (1846b) genus description, with Solenopsis mandibularis (now junior synonym of S .geminata, see below) as the type species, is at André (1881-6: 386ff) gave a genus description, with illustrations of S. fugax (Plate XXIV); this is at ; with a key to separate fugax and orbula at . Arnold (1916: 242) gave a genus description as it related to South African species, this is at . There is a quandry here in that some authors have Diplorhoptrum Mayr (1855: 449; type species D. fugax, the Formica fugax of Latreille, 1798: 46), as a separate genus. Others, stemming, it seems, from Ettershank (1966: 134) have Diplorhoptrum as a junior synonym (or perhaps a subgenus) of Solenopsis. Kempf (1972a: 232) in his catalogue of Neotropical ants, listed it as a junior synonym, citing Ettershank. This was supported by Bolton (1987: 285), who argued in favour of the Ettershank view but, like Ettershank, gave no detailed analysis to support this opinion. Significantly, perhaps, it was Mayr, himself, who first synonymized Diplorhoptrum under Solenopsis (Mayr, 1862: 751). 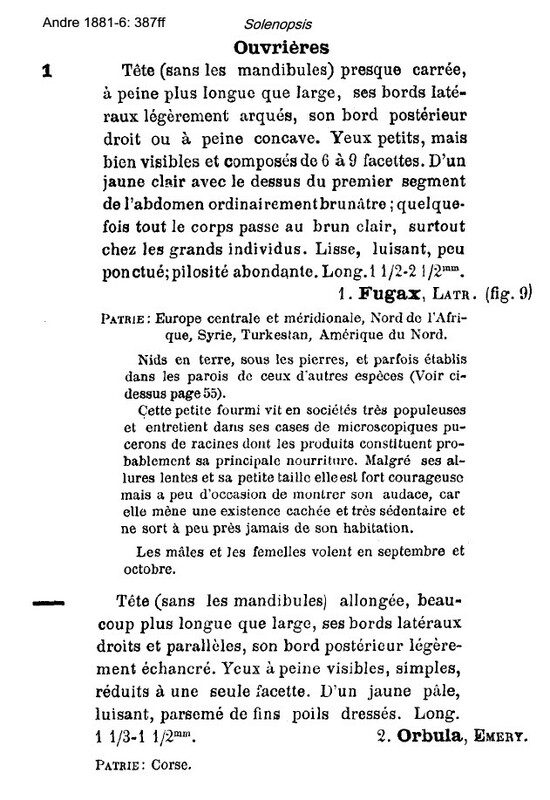 The Hymenoptera Name Server (dated 19.xii.2007) had "Diplorhoptrum fugax Latreille" but does not list the Mayr (1855) paper as the source of change from Latreille's Formica fugax. 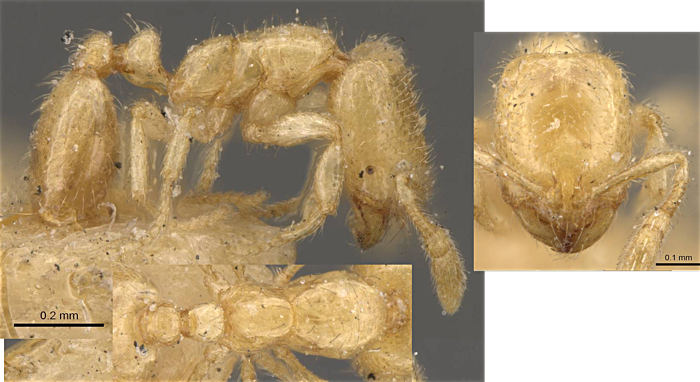 The type species for the Genus as defined by Westwood (1840b) was Solenopsis geminata (F.; Westwood separately described this as S. mandibularis) see http://antsofafrica.org/ant_species_2012/solenopsis/solenopsis_geminata/solenopsis_geminata.htm. 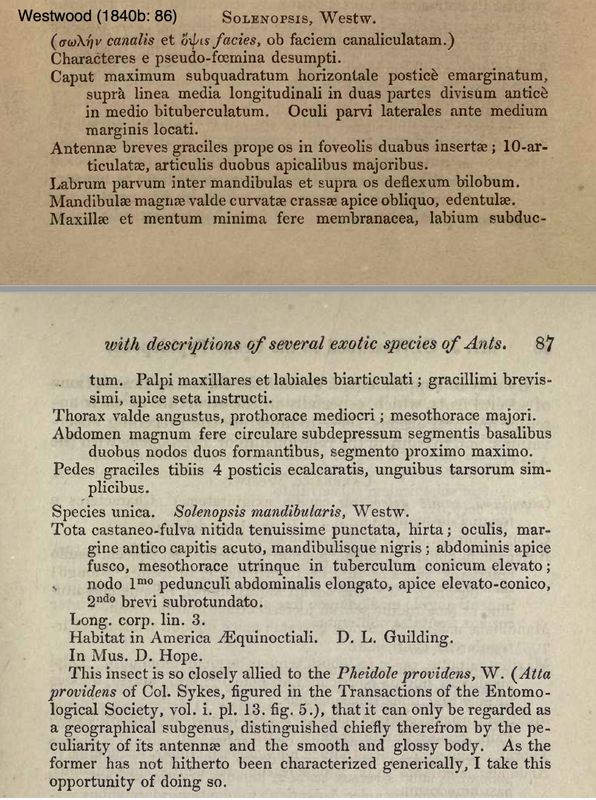 In his attempt to clarify the situation regarding Palaearctic species, Santschi (1934e: 566) wrote he had added Diplorhoptrum as a subgenus, apparently following the lead of Creighton (1930b: 42). Dealing with North American species, Creighton separated the subgenus Diplorhoptrum as the workers having the second and third funicular joints at most very slightly longer than broad, usually much broader than long; then, eyes of the worker small, sometimes absent, maximum 15 facets, usually not more than ten; and, finally, the queen with the antennal scapes not unduly thickened and gradually curved, the postpetiole not more than one and one-half times as wide as the node of the petiole. Baroni Urbani (1968a) is the primary authority for the re-establishment of Diplorhoptrum on the basis of what he regarded as distinctive male genitalia of various unnamed species from southern Europe. Curiously, however, Baroni Urbani does not cite Mayr (1862). Bernard (1978a: 533), in a revision of species from France, wrote of Diplorhoptrum as "genre extrait des Solenopsis des anciens auteurs". In that he accepted the Baroni Urbani argument. For the present, we prefer to opt for the Egyptian, indeed most if not all indigenous species known from the circum-Mediterranean area, to be placed in the sub-genus Diplorhoptrum; that is of any subgenus status is desirable. 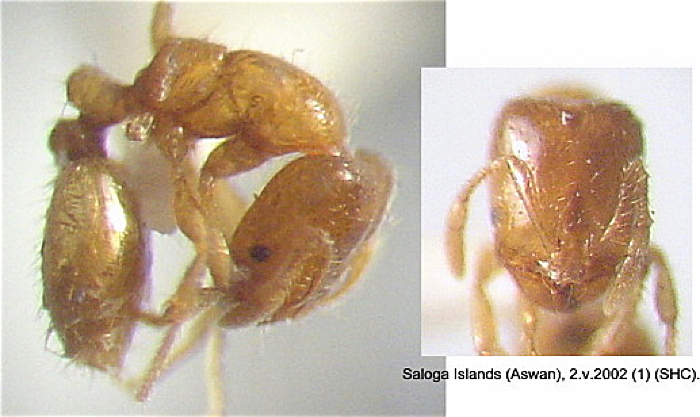 It has to be pointed out, however, that the species of Solenopsis (Solenopsis) from the Americas but with some tramp species found in sub-Saharan Africa (link given above) have quite large eyes in even the smallest specimens (TL ca 2.5 mm). Sharaf, Taylor & Klingenberg (2009) reviewed the current knowledge of Egyptian species, concluding that four species are known - S. cooperi, S. lou, S. occipitalis and S. kochi. The last was elevated to species from a subspecies of S. orbula. 2 Propodeum with transition from dorsum to declivity rounded; TL 1.3-1.4 mm; similar to orbula but with the head much less elongated, the sides weakly convex and distinctly narrowed anteriorly; extremely pale yellow, much paler than its relatives but less transparent with a milky appearance . 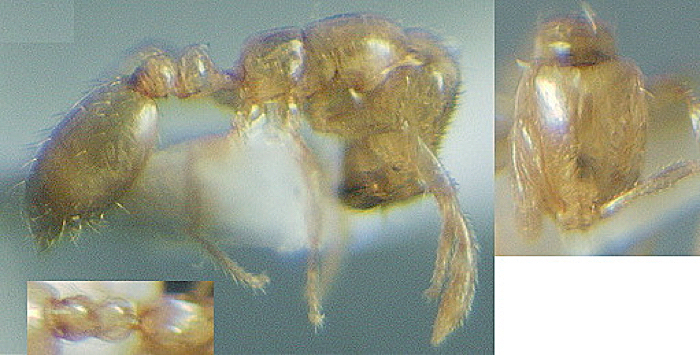 3 TL 1.3-1.5 mm; TL 2 mm in S. orbula kochi; head elongated, much longer than wide, sides straight and parallel, occiput weakly impressed; eyes clearly visible but reduced to a single ommatidium; pale yellow, shiny, with sparse erect hairs . 5 TL 1.5-2.5 mm; head near square, slightly longer than wide, sides weakly arcuate, occiput straight or weakly concave; pilosity abundant; pale yellow with first segment of gaster usually brownish, sometimes whole body pale brown, especially larger individuals; smooth & shiny, slightly punctate . 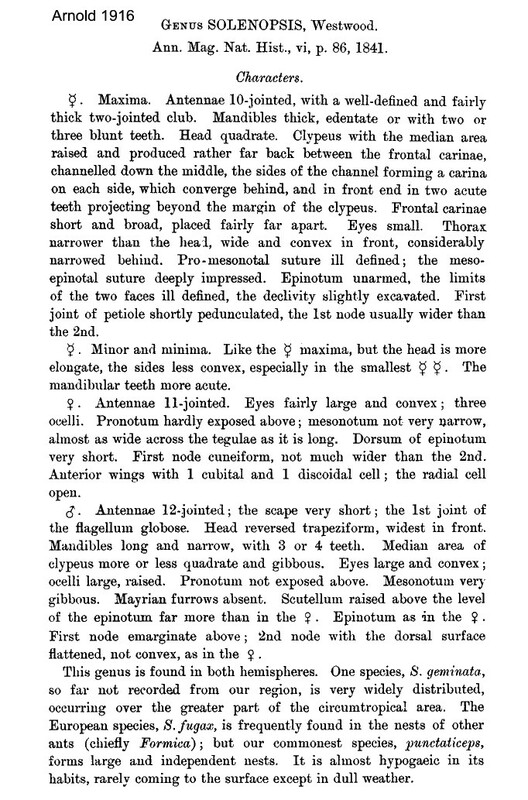 -- TL 1.3-1.5 mm; head rectangular a little longer than wide; occipitum straight with the corners rounded and slightly narrowing; clypeus more advanced than latro with the anterior teeth as long as a third of their interval; mandibles with four teeth; with bigger 3-facet eyes than latro; alitrunk short, promesonotum convex, metanotal groove deep; propodeum short quite strongly and evenly convex with no obvious transition between the dorsum and declivity; petiole node rounded and narrow (as latro) about as high as it is long; erect pilosity fine, whitish and fairly abundant; yellow-brown, mandibular teeth, occiput and basal segment of gaster darker brown, antennae and legs yellowish; smooth and shiny . 6 TL 1.8-2.5 mm, at least weakly dimorphic; yellow rust; smooth and shiny with discreet piligerous puncturation; head elongated as orbula, weakly narrowed close to the posterior corners and the sides slightly arcuate; eyes as fugax; pilosity as in fugax (abundant) .